While a fluffy pillow and warm blanket certainly make for a good night’s sleep, don’t overlook bed sheets. Bed sheets are an essential component of a complete bed. They not only protect the mattress from dirt, but they protect your skin from the harsh material on mattresses. Moreover, sleeping on uncomfortable sheets can result in low quality of life if your sleep is interrupted enough. It is important to keep in mind that not all bed sheets are created equal. One must consider the various fabric and thread count before buying one to match your lifestyle. If you are wondering where to get started, we have put together the ultimate bed sheet review. These sheets will have you thinking you are sleeping on a cloud. Crafted with 40% bamboo and 60% micro-polyester, these sheets bring ultimate comfort to the bedroom. They not only hug your body all night, but they keep the skin cool thanks to the absorbing bamboo material. If you are someone who sweats during the night, these sheets will help control your body temperature. Cosy House Collection offers their premium bamboo sheets in four different sizes: twin, full, queen, and king, and an array of desirable colors to match any bedroom. 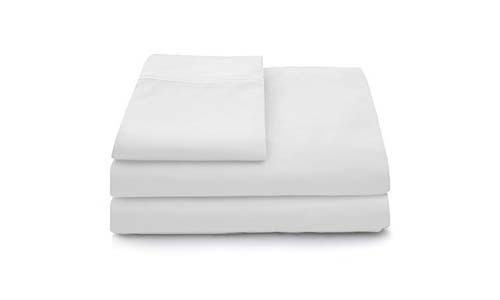 Super soft and stretchy, CGK Unlimited’s Hotel Luxury bed sheets are a great deal. 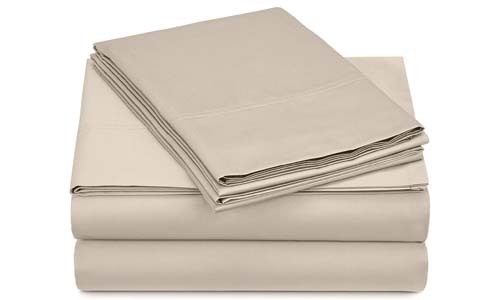 You not only get an incredible flat sheet, but four pillow cases and a fitted sheet as well. 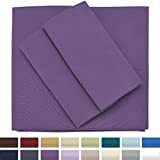 If you’ve ever had trouble stretching your bed sheets around the edges of your mattress then you will be happy to know these sheets have deep pockets. When the sheets get dirty, simply toss them in the washer and enjoy the wrinkle free material once they dry. Hotel Luxury bed sheets have a cooling effect and we know you will be a fan. Slip into luxury with Mellani’s microfiber bed sheets. These sheets are designed with premium microfiber, making your sleep cozier and cooler. The extra stretchy quality of the sheets means you can make the bed with ease. Once the sheets need to be washed, toss them in the washer on cold and tumble dry low, it is that easy! For sleepers with allergies, don’t worry because Mellani’s sheets are hypoallergenic. Experience an improved sleep with SONORO Kate’s Egyptian bed sheets. Not only are they hypoallergenic and wrinkle resistant, these sheets are made of premium microfiber material and crafted with care. 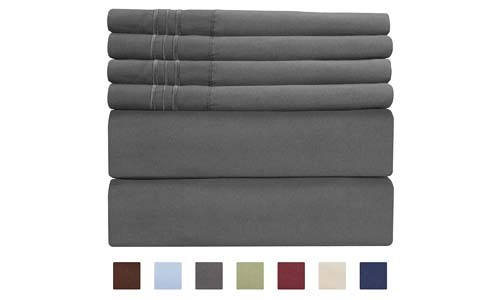 If you have ever experienced sheets that move around and cause bulging, you will love these. The deep, elastic edges of the sheets snuggly wrap the mattress and create a smooth surface to lay on. 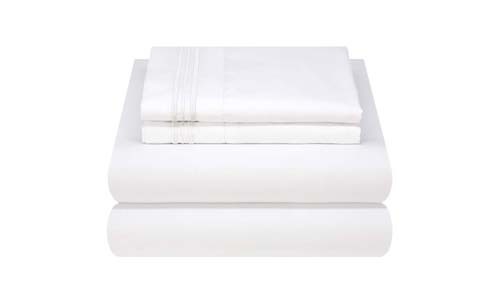 100% pure Egyptian cotton meets premium durability with Thread Spread’s Luxury Egyptian cotton. Although cotton, these sheets feel like satin to the touch. If you are looking for something that is breathable but luxurious at an affordable price, Thread Spread has what you are looking for. The deep pockets on the sheets allow for ease when fitting them around the edges of the bed. Keep in mind that with these bed sheets, washing them a few times brings out the silky smoothness of the fabric. Sweet dreams are made with these sheets. That’s right, CGK’s luxurious bed sheets are crafted with breathable fabric that allows you to sleep comfortably all night long. They are not heavy against the body, but durable to withstand stretching and frequent washing. Whether you have a twin or California king mattress, this company makes sheets for you – in amazing color choices, too. Premium quality and softness are what Mezzati bed sheets are made of. The microfiber material is smooth to the skin, as well as hypoallergenic, which means it is perfect for those with sensitive skin and allergies. 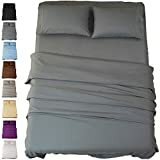 These bed sheets hold their quality and are fade resistant. That means, you can wash them as much as you like and they’ll still come out looking brand new. If you want affordable bed sheets that feel like you spent a fortune, these are the ones! The finest Egyptian cotton is used in the design of these bedsheets by Mayfair Linen. 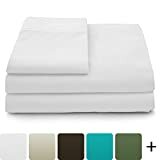 This is a great deal because you get a fitted sheet, flat sheet, and two pillowcases designed to fit any size bed you have. 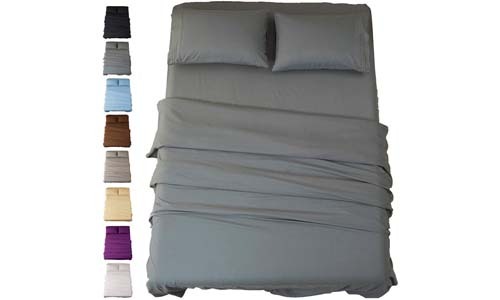 The deep pocket design means you can put the sheets on quickly and effortlessly. If for some reason, you are not satisfied with your sheets, the company offers a 100% satisfaction guarantee. That means you can buy with confidence. Your perfect sleep awaits you with the bamboo bed sheets by Cosy House Collection. Bamboo makes sheets ultra-soft and extravagant to lay on. These sheets are ideal for those who sensitive skin because the soft texture of the material allows for your skin to breathe and stay smooth. 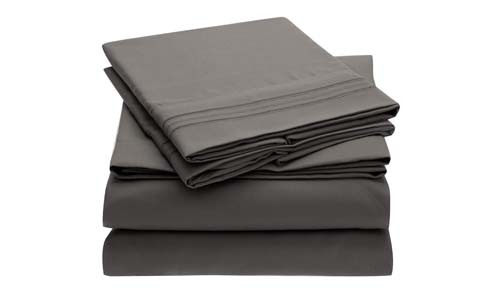 The rayon material that is blended into the bamboo gives these sheets an incredible stretch. They hug the mattress perfectly and allow you to move around with ease. Your body deserves a comfortable set of sheets to sleep on each night. 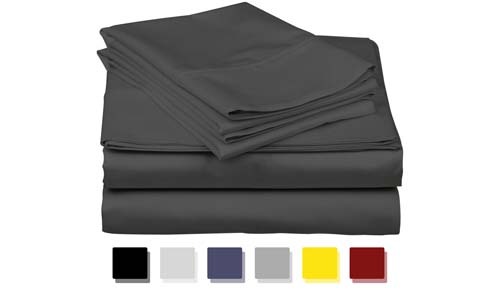 Why not choose Sateen Sheets by Pinzon? The amazing cotton material offers a comfy 500-thread count weave. 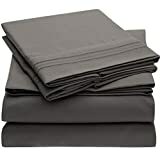 So not only are these sheets comfortable, but they are super durable too. 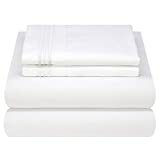 Due to the amazing craftsmanship behind these sheets, if you happen to dirty them, it only takes a quick machine wash to bring them back to brand new. 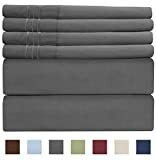 How to Choose the Right Sheets? With so many different kinds of sheets on the market, it can often feel overwhelming to find the perfect set. There are several things to consider: the material, your lifestyle, and your budget. Material Depending on where you live, the night is usually chilly and the day is warm. The last thing you want is bed sheets that are cold and uncomfortable to sleep on. A cotton is a great option for those living in cooler climates because the cotton keeps the warmth in, but still allows the body to breathe and cool itself. Moreover, cotton feels soft against the skin. If you are going to buy cotton sheets, make sure you purchase one of premium quality, like Egyptian or Pima cotton. Bamboo blends are another incredibly soft material. They are super smooth to wrap-up in, cool the body down instantly, and are even antimicrobial. Linen is perfect for those individuals living in warm climates. It is breathable but also comes with a casual, wrinkled look – if you like that look in your bedroom. Lastly, satin is a great choice for those going for a luxurious look in their bedroom. Satin is ultra-shiny and extravagant, but some individuals may not like the texture of it. When going to purchase sheets, always ask to feel a sample. That way, you know what you are buying and if it agrees with your skin. Additionally, always ask about the store’s return policy in the case that you need to return your sheets. Bed sheets are the most important part of a bed – they can either make or break a sleep. Finding the most comfortable bed sheets do not have to be a challenging task, but it does have to be done the right way. 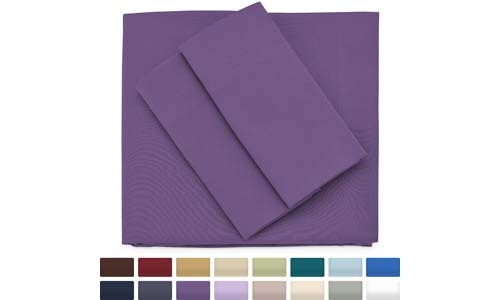 Take your time trying out different sheets, and always ask for a sample at the store to touch or even lay on. 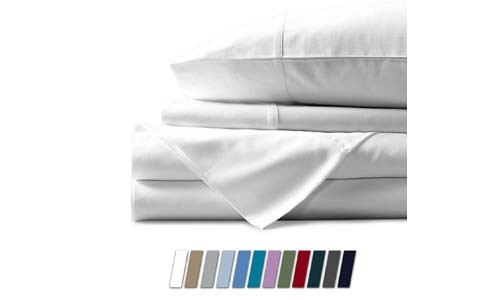 A good pair of sheets means you will be on your way to a perfect sleep every single night.